Denver Charter Bus Company access a large network of charter buses, including motorcoaches ranging in size from compact to spacious models. School groups of all sizes traveling for an academic event in Denver will find a safe and efficient transportation solution with us. Chaperones and educators can rest assured that everyone will arrive to field trips, college tours, academic conferences, and any other events around Denver. From the sciences to art and history, Denver has learning centers of all types for students across various age ranges. Allow Denver Charter Bus Company to get your academic group to your next field trip! Call us anytime at (303) 495-2341 for a free quote! When you’re traveling with children, safety is of the utmost concern. We understand this more than anyone. At Denver Charter Bus Company, we put safety above all else, especially when transporting children. The large network of drivers we work with are made up of safe and professional individuals with pristine driving records. Each driver is required to pass background checks and drug tests before operating a vehicle with Denver Charter Bus Company. The buses we charter are also modern vehicles equipped with quality safety features to keep students safe in any possible emergency. Every student will remain safe and sound throughout their entire field trip. Denver has an endless number of educational opportunities for students of all ages. Many learning centers offer discounted rates for academic groups or even free admission depending on the occasion. Whether you’re taking one class on a field trip or you’re planning an event for your entire school, you can rely on Denver Charter Bus Company for all field trip transportation needs. We’ll pair you with spacious and comfortable transportation solutions for your trip to any educational location in Denver. Looking to get your students more in-tune with nature and the beautiful Colorado landscape? There’s no better place than Red Rocks. When there isn’t an event taking place, admission to the park and amphitheater are free. Explore the iconic rock formations and hiking trails with your science class or other young adventurers. The Denver Museum of Art is one of the most-visited attractions in the city. With extensive collections and rotating exhibitions, there’s sure to be something that piques the interest of your students. The museum also offers specialized school tours and lesson plans for visiting groups. Best of all, the museum is free to children every day. This popular museum is an important local source for learning about the natural wonders of the world. Whether your students are interested in space, dinosaurs, gems and minerals, or anything in between, the Denver Museum of Nature and Science has so much for students to explore. Explore the IMAX theatre and planetarium or even dive into the popular Discovery Zone. Organized and pre-registered school groups receive free admission to the museum every day. Often hailed among some of the best botanical gardens in the country, the Denver Botanic Garden has 24 acres filled with learning opportunities for students. 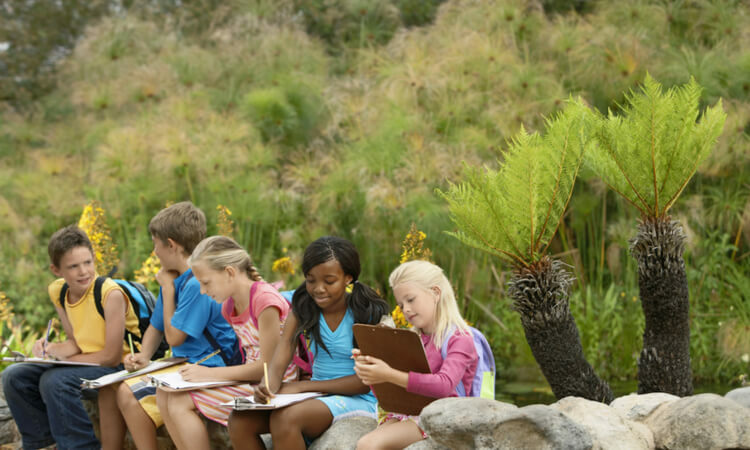 There are self-guided and guided field trip opportunities for schools. Marvel at the beautiful local and exotic floral exhibitions and breathtaking glass art installations. Local school groups can take advantage of discounted rates when registering for a field trip. Denver and the surrounding area are home to several universities that local high school students tour before making the big plunge into college life. A private charter bus rental will keep your tour group organized while shuttling from campus to campus for tours. Rent a full-sized 56-passenger charter bus to shuttle a group of seniors up to Boulder to explore University of Colorado — Boulder, or keep the trip local and tour CU Denver instead. Privately organized groups like academic organizations or clubs can choose a smaller minibus to better suit travel needs to campus tours. With a charter bus rental, you can even visit both campuses and plan your own unique schedule. Denver Charter Bus Company travels on your tour group’s time so you won’t have to rush while exploring each campus. Is your high school or college sports team playing a big away game this season? You won’t have to miss the game because of distance or lack of travel options. With Denver Charter Bus Company, you and your friends or fellow fans can travel to away games with ease and in comfort. We work with each group’s unique itinerary to be sure you don’t miss a second of game day. Cheer on the CU Buffaloes or CSU Rams at their next away game after you plan a fun tailgate with your group. If you’ve got an on-campus event that requires shuttle services, we’ve got you covered. Whether you have guests coming into town for an academic conference, symposium, Greek event, or special show, you can count on us for their transportation. Don’t make your attendees walk across campus to get to your event; book a private coach that’s dedicated to your guests and their travel needs. Our team of rental experts are here 24/7 to assist you with your next school trip in Denver. Give us a call anytime (303) 495-2341 to chat with one of our representatives about your field trip, college tour, or academic transportation needs. We’ll find you the best travel accommodations for your trip!